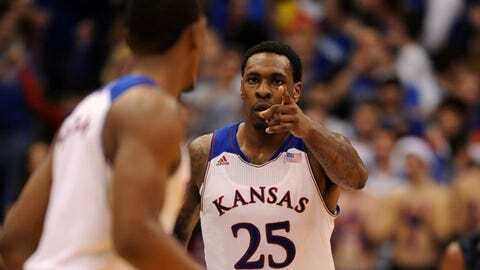 Lawrence, KS, USA; Kansas Jayhawks forward Tarik Black (25) celebrates after scoring during the second half of the game against the Georgetown Hoyas at Allen Fieldhouse. Kansas won 86-64. Kansas has played a pair of Top 25 teams and faced a few opponents who later moved into the AP poll in 2013-14. The Jayhawks may face another tough test against undefeated Toledo on Monday night. The Jayhawks (8-3) have been off since Dec. 21 and are hoping the momentum they built before the holiday break hasn’t disappeared. They’ve won their last two games against New Mexico and Georgetown by a combined 39 points. "We just know we are getting better," guard Wayne Selden, Jr. said. "I’m still getting comfortable, still feeling things out. We are all blending together after every game. I’m pretty happy with the direction we are going in." Kansas has seen improvement from many of its young players as the season has progressed. Selden and fellow freshman Andrew Wiggins have started every game, and the team recently moved another first-year player, center Joel Embiid, into the starting five. Since joining the lineup, Embiid has averaged 13.7 points, 6.7 rebounds and 75.0 percent shooting. The Jayhawks will face a Toledo team that ranks among the best in the country with 86.3 points per game. Five Toledo players average in double figures, led by guard Rian Pearson at 16.6 per contest. Pearson scored a game-high 22 points in the Rockets’ 85-66 victory over Coppin State on Saturday. "It’s a solid team," Kansas coach Bill Self said. "For them to be 12-0, coming in here, with a ton of confidence. They’ve got some good wins and they’ve won some close games." Self said his players are well-prepared for the challenge, given the tough schedule his team has already encountered. After Toledo, the Jayhawks face 10-1 San Diego State on Sunday before starting Big 12 play Jan. 8 against 11-1 Oklahoma. "From a record standpoint, I was hoping we could get to Christmas with less than three (losses)," Self said. "If we are able to play well the next two game, I would think that’s about the record we should have going into conference play. "Have we played great? No. Have we gotten better? Yes. I wouldn’t be surprised if we had lost one or two less, but I’m not surprised where we are at all." Selden agreed with his coach, saying the tough non-conference slate the team has played will prepare it for Big 12 action. Kansas has beaten then-No. 4 Duke and lost to then-No. 19 Florida, and current No. 8 Villanova and 20th-ranked Colorado joined the Top 25 the week after wins over the Jayhawks, staying there since. "Coming in and playing all those big games so early is getting prepared for later in the season," the point guard said. "I feel we’ll be used to the stage by the time we get there." Toledo has lost eight straight to ranked opponents, with its last such victory coming exactly 11 years ago on Dec. 30, 2002, when the Rockets beat No. 14 Michigan State 81-76. Allen Fieldhouse has not been too inviting to unranked non-conference foes, as Kansas is 44-1 in its last 45 against those teams.